Ethan’s litigation practice is focused on complex catastrophic injury, wrongful death and medical malpractice matters. The breadth of Ethan's experience is extensive, having successfully resolved serious injury and wrongful death cases arising out of, among other circumstances, automobile and tractor trailer collisions, pedestrian deaths, All-Terrain Vehicle accidents, construction accidents, drownings, boating/propeller accidents and house fires. Ethan regularly obtains million dollar plus settlements and/or verdicts for his clients, and has achieved record-setting results. For example, in 2015 he obtained a $2.8 million jury verdict in Calvert County, Maryland, in a case arising out of the death of a 63 year-old husband and father in a car accident. The verdict is believed to be the largest in Calvert County history. As another example, in a case arising out of the death of a young boy who drowned in a pond, Ethan set out to satisfy a discrete legal element of the case without which the case could not survive. After spending hundreds of hours tracing voluminous and archaic legislative history, Ethan located and produced a document from 1975 which proved the necessary element of the case, resulting in a significant recovery for the boy’s family. His track record of obtaining tremendously favorable outcomes for his clients has resulted in him being regularly called upon to litigate the firm’s most serious, and often tragic of cases. Ethan also enjoys performing pro bono legal services for deserving organizations that do important work in the local community. For example, he has represented The League for People With Disabilities, a charitable organization dedicated to providing vocational, rehabilitative, educational and medical services to thousands of individuals each year with multiple physical, cognitive and neurological disabilities. In that matter, Ethan convinced the City that it had grossly over-billed The League for water and sewer services over a number of years and obtained a settlement of over $380,000, which represented every penny of what Ethan claimed was owed with no compromise whatsoever. Since that representation, Ethan has enjoyed remaining actively involved in The League, including sitting on the Committee which puts on the organization’s largest fundraiser of the year. During law school, Ethan served on the University of Baltimore Law Review, and took on an active role teaching legal research, writing and appellate advocacy skills to first-year law students. 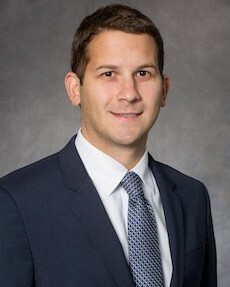 Prior to joining Silverman, Thompson, Slutkin & White as an Associate, Ethan worked for the Honorable George Levi Russell, III of the United States District Court for the District of Maryland.